I know this is a long time away in weather terms. But what is the end of February looking like in NYC? Im there for a week from the 18th of February. snowstorm and blizzard in Bosto and northeast coast. The surface chart for the NE at 0600 and the 250mb wind field for the US at 00z. A classic Norâ€™easter plowed up the East Coast of the United States on January 12, 2011, dumping heavy snow on New England states for the third time in three weeks. The storm began developing late on January 11, as a snow-making system that had hit the southern U.S. rode up the Atlantic seaboard and merged with another system crossing from the Midwest. The Moderate Resolution Imaging Spectroradiometer (MODIS) on NASAâ€™s Terra satellite took this photo-like image at 10 a.m. Eastern Standard Time on January 12, when the storm was centered over southern New England. As Nick F so rightly said. Image courtesy NASA Earth Observatory. The second major snow storm of the winter blanketed the U.S. Northeast and cancelled thousands of flights on Wednesday, battering parts of New England with blizzard conditions and up to 30 inches (76 cm) of snow. The National Weather Service reported snow on the ground in 49 of the 50 states - only Florida was spared-- and much of the South was still battling icy conditions that forced Atlanta schools and government to close for the third day in a row. New York City's Central Park received 9 inches (23 cm) of snow, less than half the amount that fell in a post-Christmas blizzard that paralyzed the city and dented the popularity of Mayor Michael Bloomberg because of a substandard cleanup. Financial markets operated normally, though the snow could affect upcoming employment data, possibly reducing U.S. payrolls by 50,000 because it hit during the survey week for the January employment report, UBS Investment Research said. "To arrive at that estimate, we looked at blizzards in the past and at the consequent deviations from trend in monthly payroll growth," UBS said in a note to clients. Thunder and lightning struck Boston and the New England states. Between 12 and 14 inches (30 to 35 cm) of snow fell in the Boston area. Massachusetts Governor Deval Patrick declared a state of emergency after snow surpassed initial forecasts, saying snowfall could reach 30 inches (76 cm) in the western part of the state. Springfield officials called it the heaviest snowfall since the blizzard of 1978. "A snow storm will continue to bury New England today with fierce blizzard conditions towards the coast, creating nightmares for travellers and residents," Accuweather senior meteorologist Kristina Pydynowski said. Its been snowing here without a break since friday morning and is still falling...i think we have had 10 days in a row of falling snow..and i have now over 80cm of level snow around my house. Have spent a much as an hour or more each day shovelling snow to keep my drive and footpaths clear and have piles of snow close to 8ft high either side of my driveway. It is the same all round the city and would be impossible to get out of my street without 4 wheel drive. Some areas could be mild, some areas will be bone chillingly cold, temps down to -50C are being progged by GFS for certain parts northern of the US boarder, the charts also predict the cold to spread across the states come 4 days time. Quite a temperature difference either side of the main frontal system at midday. Just an update at 1800z although the synoptic situation vis-a vis the air masses either side of the main frontal system remains pretty static. Good late Sunday evening gang. The new NAM is in and it continues to show a more south and east storm for late Tuesday through Wednesday and is, not only a miss for us, but a miss for the entire east coast. The mid and upper levels of the model run look much better and don't match up with what the model is showing at the surface. Why is that? This is something I talked about earlier with the GFS and I believe it is happening with the NAM as well... convective feedback. Good Monday everyone and welcome to a very busy weather week. It is getting started off with some light snow across the region today before what will become a major winter storm for much of the eastern half of the country. For that reason... we are in Winter Storm THREAT mode for Tuesday night and Wednesday. The trend toward a bigger hit on our region continues and we will get to that in a moment. Well its pouring with rain here this morning..very unsual to have rain (not freezing rain) in this part of the world in January..the temperature has been above freezing everyday since last thursday and will stay above until friday..so the big melt is on! Anyone for a break in Miami? Looking at the map places in mexico are colder than here right now! Interesting temp anomaly map from NASA for 9th-16th of Jan.
it is a blamy +11c today thats some +20c above the normal daytime high for this time of year...there is so much slush and water flooding the roads and pavements looks like we've just had huge rain storm. Should make things interesting as temps start to fall away and we are back down -20c by tomorrow evening. Synoptic plots for Canada at 1800z. A two-stage winter storm struck, paused, gathered its breath and delivered a crippling blow to the Northeast on Thursday, dumping more than a foot of snow, closing airports and schools, stranding commuters and shattering January records. The storm, appearing as a giant white smudge over the Northeast on radar maps, knocked out power to half a million people in and around Washington, although it reserved its heaviest snowfall for New York City and the surrounding area. Nineteen inches of heavy, wet snow fell on Central Park, tied for the highest total in the region and only an inch less than the 20 inches that paralyzed the city a month ago, according to the National Weather Service. Parts of Connecticut and New Jersey received nearly as much, and snowfalls totaled at least a foot from Boston to Philadelphia. Around Washington, where downed power lines left swaths of the region in darkness, precipitation began as rain Wednesday, then froze. Roadway commutes took as long as 12 hours, as drivers slipped and got stuck. "Conditions got very slick, very fast," said John D. Lisle, spokesman for the District of Columbia's Transportation Department. "Plows had to battle traffic to get the salt down." After hours in traffic, people began abandoning cars, and some actually slept in them, according to reports. In Philadelphia, 150 buses were stuck through part of the night, with passengers spending the night on some of them, said Southeastern Pennsylvania Transportation Authority spokeswoman Heather Redfern. New York City schools and offices were closed. Bus service was knocked out in most of the region through the morning rush, as hobbled train systems struggled to absorb the overload, although bus service was slowly restored as the morning wore on. At the airports, delays and cancellations were the order of the morning, although there, too, things were clearing up by noon. The storm created a new round of snow fatigue in a region that has been unusually battered. Yet in New York City, where the slow municipal response to the Dec. 26 blizzard became a black eye for Mayor Michael R. Bloomberg and transit officials, things were not as dire as they could have been. Mr. Bloomberg said on radio Thursday morning that all primary roads had been plowed, and some secondary streets were beginning to be cleared. By suspending bus service in the city, the Metropolitan Transportation Authority avoided a rerun of the December storm, when hundreds of buses got stuck in the snow, blocking plows and other traffic. Indeed, this time many New Yorkers seemed not to be fazed by the latest round of white weather. "I think it's normalized," said Andrea Stribling, 25, of Brooklyn, a Manhattan political canvasser. "I'm kind of used to it. Ever since the first big snowfall, it seems there's always been a thick layer of snow on the ground. I think everyone is getting used to it." At a news briefing, Mr. Bloomberg said that while several dozen ambulances got stuck in the snow, relief ambulances arrived quickly to ferry the ailing to hospitals. And while the 911 system was flooded with calls, and dispatches were slowed, "no calls ever remained in a queue," the mayor said. The cancellation of school meant that thousands of city high school students scheduled to take the state Regents exam could not do so, but the mayor said: "That's a problem for the state. We'll get to it later." In Massachusetts, hundreds of schools were closed, and yet another commute was snarled by snow. Two men had to be rescued from a car inside the parking garage of a Lynn, Mass., commercial building after its roof collapsed early Thursday. Both men were taken to Massachusetts General Hospital with minor injuries, said Massachusetts Emergency Management Agency spokesman Peter Judge. Across the Eastern Seaboard, snow -- and snow budgets -- are far above the average for this time of year, but there is still plenty of winter left. "I guess the average for the year for the Greater Boston area is around 40 inches, and now we're at about 60," Mr. Judge said. "We're about halfway there to get to the record, which is really scary when you think about it." The weather even played havoc with President Barack Obama's schedule. After returning to Washington from a quick trip Wednesday to Wisconsin, Mr. Obama's motorcade spent an hour in rush-hour traffic. He was supposed to return to the White House by helicopter, The Associated Press reported, but the weather grounded Marine One. The federal government opened two hours late, and the District of Columbia government was closed. A Democratic Party worker, Jen Bluestein, said she spent so long in traffic -- three hours on what normally would be 15 minutes driving from Connecticut and L Street downtown to Alexandria, Va. -- that her iPhone died on the ride. "Ever seen a compulsive political operative trapped in a slow-moving vehicle with no phone or e-mail?" she said. "Not pretty." We have gone from the warmest spell of the winter to the coldest in the space of 3 days..we reached the dizzy heights of +11c thursday afternoon and now sunday evening the temp is -37c..strangley it will then rebound back to +6c by wednesday now thats what i call winter! According to folklore, if a groundhog leaves its burrow on February 2 does not see its shadow, this will signify that the end of winter is coming. However, if the groundhog sees its shadow then it will retreat back into its burrow and there will be another six weeks of winter. The Groundhog Day storm prediction comes as normal service was resuming in the winter-weary north-eastern U.S. 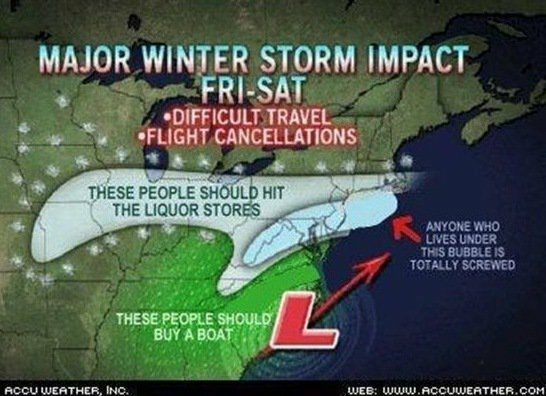 It may not reveal very much about this particular storm, and it sure isn't going to give you any concrete data, but this illustration is actually more useful than the average weather map. Try finding another map that offers such valuable information as who should hit liquor stores when and who is "totally screwed."